The 2007-2009 Great Financial Crisis (GFC) and the 2010-2012 euro area sovereign debt crisis were very damaging to the EU banking sector and forced EU Member States to undertake bold actions to keep the banking sector afloat. 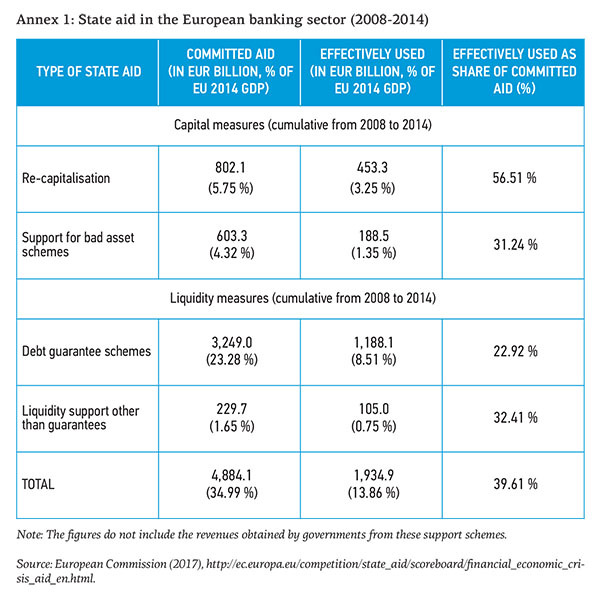 During the period 2008-2014, EU Member States committed in total EUR 4,884.1 billion of state aid1)Approved by the European Commission Directorate General Competition http://ec.europa.eu/competition/state_aid/legislation/temporary.html , which was broadly divided into four categories, namely: recapitalisation (€ 802.9 billion), asset relief measures (€ 603.3 billion), guarantees (€ 3,249 billion) and other liquidity measures (€ 229.7 billion), from which an overall reported amount of (€ 1,934.9 billion) was used (see Appendix 1). Beyond the different forms of state aid used, European banks also received massive emergency liquidity assistance from central banks to keep liquidity flowing in the interbank system. The economic and social costs of bailing out European banks during this period have been unprecedentedly large for the European economy as a whole and for European taxpayers in particular. This exposed the fundamental weaknesses in Europe’s financial architecture, coupled with decades of flawed banking regulation and supervision which necessitated a major regulatory overhaul from both an institutional and legislative perspective. Amongst the institutional and legislative reforms, the Bank Recovery and Resolution Directive (BRRD) 2) Introduced and expected to be transposed into the member states’ national laws on 31 December 2014. was a cornerstone and the first step in dealing with failing banks in an orderly fashion as well as helping to reduce market disruptions at the EU level. By the end of 2015, national resolution authorities were established almost everywhere throughout the EU,3)Except five countries including Czech Republic, Luxembourg, the Netherlands, Poland, Romania and Sweden http://europa.eu/rapid/press-release_IP-15-5827_en.htm with clear powers and tools to act. The practicalities of resolution and, later on, the restructuring of a failed bank is not an easy endeavour, however. Several issues may interplay to make resolution and restructuring successful. These issues include the level of complexity and interconnectedness of the ailing bank, the effectiveness of the resolution planning process and the level of coordination among the various authorities involved in the resolution, the adequacy, fairness and transparency of balance sheet valuations, adequate planning of the restructuring process and intricacy of how to deal with legacy assets etc. 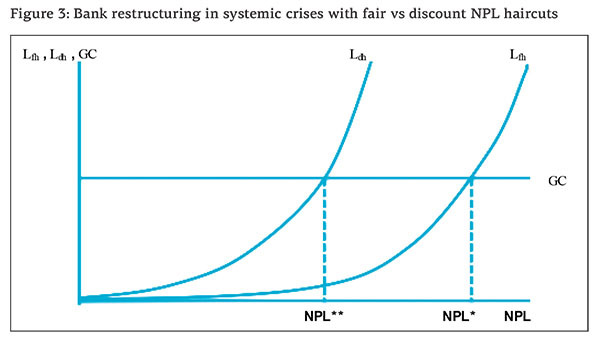 Non-performing loans (NPLs) are at the root of most banking crises. To understand the challenges involved in the resolution of NPLs in the Eurozone, we provide a brief comparative study of government-backed solutions to deal with NPLs, referencing selected cases in Sweden, Japan, the US (RTC and TARP) and Spain (FROB and SAREB), emphasizing what works and what doesn’t work. The examples of Spain and Ireland are relevant, because they were Eurozone member states that used state-backed money to clean up the troubled financial institutions’ balance sheets of toxic assets.4)However, as we discuss later, since the coming into force of the BRRD, any bank receiving state aid must impose losses on its unsecured bondholders. See arts 44(5) and (7), 37(10)(a), Rec 73, BRRD. The very definition of NPLs is a matter of controversy, as examined in Bholat, Lastra et al. (2016). Divergences in their valuation, accounting and regulatory treatment across jurisdictions, time, databases and – within the institutions themselves – according to whom they have to report and for what purpose, complicates the comparability of bank soundness and renders stress tests a less useful tool in assessing solvency. According to EBA (2016), the EU weighted average NPL is highly dispersed across EU countries, ranging from below 5% in financially sound member states and up to 45% in financially distressed countries like Greece and Cyprus. A generalized banking crisis (of a systemic nature) is treated by the authorities differently from isolated bank failures in a sound economy. The former often results from or reflects the deterioration in the economic environment, or poor macroeconomic management. The costs of a crisis can, of course, be magnified by weak bank supervisory structures, or by supervisory and regulatory mistakes. And good crisis management is crucial for preserving, or quickly restoring confidence in, the banking system, which is indeed the ultimate rationale of the whole supervisory process. Governments can choose to deal with each troubled bank on a case-by-case basis, using a mix of strategies (takeovers and rescue packages in some cases, liquidation in others etc.) or they can choose an overall strategy to deal with all the troubled institutions. The difficulty of calculating ex ante the total amount of the losses and the speed with which a crisis unfolds, adds to the complexity of its resolution. The experience in the US, Sweden5)http://www.riksbank.se/Documents/Avdelningar/AFS/2015/Session%201%20-%20Englund.pdf and Spain suggests that a comprehensive strategy involving recapitalization is the most efficient and prompt way of resolving a systemic crisis. Governmental assistance – often by creating a centralized agency – is needed to resolve a systemic crisis, because of the potential for disruption to the nation’s economy and of social unrest (Lastra, 1996, pp. 139-143). Delaying the resolution of problems or ‘buying time’ is generally not a good strategy, and Japan’s lost decade (briefly assessed below) provides clear evidence in this regard. That is why the proposal by EBA Chairman Andrea Enria – and by Avgouleas and Goodhart – to create an EU’s Asset Management Company (AMC) to buy billions of euros of toxic loans (estimate: 1 trillion euros)6) https://www.ft.com/content/3b18e5ec-d047-36b2-a35a-10ae8e6a76ed. It should be noted, however, that the €1 trillion of gross NPLs reduces to €0.6 trillion net NPLs if one considers the average coverage ratio of 40% that European banks possess. seems a sensible one. The taxpayer-backed fund proposed by Mr Enria is in line with historical precedents that we analyse below. It is also a recognition that stress tests have not been bold enough and that heavy NPLs compromise the health of many bank balance sheets in the Eurozone. There is a certain pattern or dynamics that develops, in terms of the measures public authorities take to deal with systemic crises. At the beginning of a generalised banking crisis, the authorities tend to provide emergency liquidity assistance, hoping for an early restoration of confidence, in the belief that the problems are of short-term illiquidity rather than insolvency. In 2007 and early 2008, this was exactly what the ECB did in the Eurozone, the Bank of England did in the UK and the Federal Reserve Bank of New York did in the US. However, if banks start failing or getting into further trouble (suggesting that the problems are more than liquidity constraints) the government is often compelled to provide solvency assurances to depositors and to design a coherent policy, with an expeditious decision-making process and a clear voice. The government faces the delicate and difficult policy choice of whether, and when, to commit fiscal resources to recapitalize banks. In the case of the Eurozone, this task is further complicated by the fact that fiscal policy remains in the hands of the national Member States, though the ESM (and eventually the Single Resolution Fund) can provide [limited] financing under the terms of the ESM Treaty (and the SRF under the terms of its governing rules). Two extreme solutions are available to governments when dealing with systemic crises: liquidation on a large scale (an unlikely solution given the public interest at stake) and (total or partial) nationalization via large injections of capital to all (or most) troubled institutions, as happened in Sweden in 1992. Between those two radical solutions (saving all institutions via de facto nationalisation or letting all institutions fail) lie a variety of other solutions and policies, ranging from debt restructuring techniques (when the links between bank debt and sovereign debt prove strong, this can be an effective alternative, in terms of value preservation and market attractiveness) to a mix of government and private assistance (like the so-called ‘lifeboat operation’ in the UK that was applied to solve the secondary banking crisis in 1974) or the creation of a government backed centralized agency or a comprehensive centralized program (funded by taxpayers’ money). It is a government backed centralized agency at the heart of the proposals by EBA’s Chairman and by Avgouleas and Goodhart, further discussed (and endorsed) below. A centralized agency to dispose of the assets of failed institutions was created in the US by the 1989 Financial Institutions Reform, Recovery and Enforcement Act (FIRREA) under the name of Resolution Trust Corporation (RTC). RTC managed the assets of the failed Savings and Loan associations. Of course, the creation of such an agency was complemented by other legislative and regulatory measures designed to strengthen supervision. A centralized agency7)See http://www.frob.es/en/Paginas/Home.aspx The Fondo de Reestructuración Ordenada Bancaria (FROB), was a government funded program adopted by the Spanish government in June 2009 to manage the restructuring and resolution of troubled credit institutions (cajas de ahorro and others). also saw the Spanish banking system sail through its deep structural problems as a consequence of the effects in the Eurozone of the GFC. The example of Sweden and the more recent example of TARP (Troubled Asset Relief Program/s)8)https://www.treasury.gov/initiatives/financial-stability/TARP-Programs/Pages/default.aspx in the US corroborate the effectiveness of government led programmes in achieving a prompt resolution of the crisis. Japan, after several failed strategies, only solved its severe banking crisis through a comprehensive programme. Japanese authorities were perceived ambivalent during the 1990s on the degree of support they intended to provide to troubled financial institutions. The so-called ‘Japan premium’ denoted a logical market reaction to this situation, which was only solved much later when ample government assistance recapitalized the ailing banking system. ‘The Japanese government’s response to the financial crisis in the 1990s was late, unprepared and insufficient; it failed to recognize the severity of the crisis, which developed slowly; faced no major domestic or external constraints; and lacked an adequate legal framework for bank resolution. Policy measures adopted after the 1997–1998 systemic crisis, supported by a newly established comprehensive framework for bank resolution, were more decisive. Banking sector problems were eventually resolved by a series of policies implemented from that period, together with an export-led economic recovery. Japan’s experience suggests that it is vital for a government not only to recapitalize the banking system but also to provide banks with adequate incentives to dispose of troubled assets from their balance sheets, even if that required the government to mobilize regulatory measures to do so, as was done in Japan in 2002. Economic stagnation can cause new nonperforming loans to emerge rapidly, and deplete bank capital. If the authorities do not address the banking sector problem promptly, then the crisis will prolong and economic recovery will be substantially delayed’. First, in order to address a banking crisis properly, prompt action to gauge the exact amount of loan losses is a critical initial step, although this is not an easy task… Second, a government recapitalization operation that involves taxpayer funds is the most direct policy measure to contain the acute phase of market turmoil (and, as the authors note, most of the public funds allocated to banks were recovered by 2008) … Third, the removal of impaired assets from banks’ balance sheets is essential to the restoration of bank health. A government initiative to purchase bank assets is often necessary to restructure bank balance sheets during a crisis, as when markets lose their ability to determine prices, the government is better able to maintain flexibility in timing and so could realize higher values for those troubled assets. Fourth, economic stagnation can cause new NPLs to emerge rapidly, and deplete bank capital (emphasis added). Landier and Ueda (2009) argue that government intervention is justified only for systemic banks or in cases of a generalized financial crisis. Otherwise, the government can let normal bankruptcy procedures apply. Market imperfections call for a restructuring operation, to reduce the probability of default, which requires simultaneous action on both assets and liabilities. Voluntary restructuring of a bank is decided by shareholders, who would oppose such measures as debt renegotiation because they lower the value of equity relative to that of debt. That is why some transfer from the government is called for, unless the government finds a way to make restructuring compulsory. A bank that is asked to participate in a restructuring plan would be reluctant to do so because of the negative signals this would transmit to the public. Also, one of the primary considerations of any form of asset sales is what message will this send. Bank managers have better estimates of the value of the assets of their institution than the public does. Government and private investors must do their own due diligence in order to come up with an estimate of the value of the assets. Recently, Medina Cas and Peresa (2016) study AMCs set up in three EU jurisdictions to carve out legacy (impaired) assets from banks in the aftermath of the 2007-2009 GFC and ponder the factors that make such ‘bad banks’ a success. The study features NAMA (National Asset Management Agency) set up in Ireland in 2009, FMS Wertmanagement set up in Germany in 2010 to manage the impaired assets of one specific banking group, Hypo Real Estate Holding AG, and SAREB (Sociedad de Gestión de Activos procedentes de la Reestructuración Bancaria) set up in Spain in 2012. While FMS is publicly owned, NAMA and SAREB combine private-public ownership. The final composition of these three AMCs was carried out in close consultation with the European Commission, since each needed approval under the EU state-aid rules. The effectiveness of these AMCs is examined along five criteria to determine their success: (1) Ex-ante transparency in reporting the legacy assets (though this condition was not met in the case of SAREB); (2) Valuation by and independent institution (this condition was met in the three AMCs); (3) Reference recovery rates based on trustworthy risk assessment model (this condition was met in the three considered cases); (4) Certainty of the legal framework underpinned in the structures and, finally, (5) Adequate skills and appropriate ethics of the management of the AMC. Particularly relevant to our study is the case of SAREB (Company for the Management of Assets proceeding from Restructuring of the Banking System), established as a condition set by the EU in exchange for aid of up to € 100 billion for the Spanish banking sector and designed and developed from the work of three independent specialists: Oliver Wyman, BlackRock and European Resolution Capital (ERC). SAREB functions as a ‘bad bank’ acquiring property development loans from Spanish banks in return for government bonds, with a view to maintain and, if possible, to improve the availability of affordable credit to the economy. Private shareholders own 55% of SAREB and the remaining 45% is held by FROB Fondo de reestructuración ordenada bancaria (FROB), the Spanish banking bailout and reconstruction program established in June 2009. Medina Cas and Peresa (2016) emphasize the need to attract skilled, qualified and experienced staff, to outsource some of the services and to have solid corporate governance rules. Having a favourable macroeconomic context, in particular the recovery of the mortgage market, is also a positive factor for AMCs. The regulatory context in which these three AMCs were created has since evolved significantly. At the time when they were approved by the European Commission, the BRDD was still in gestation. The directive has now been in force since 2016 and any future AMCs or ‘bad banks’ need to take into account the BRRD resolution tools and requirements as well as the Banking Union legislation. However, the positive experience of establishing a bad bank cannot be ignored. Gandrud and Hallerberg (2014) argue that assessing recovery rates has to be done in the context of preventive measures, to avoid future turmoil and fire sales. It is always more beneficial to taxpayers to insure the entire asset pool of a bank than a specific pool. Those schemes usually combine asset guarantees with capital injections, as exemplified by the UK intervention in January 2009 to support systemically important banks, with the Royal Bank of Scotland and Lloyds HBOs being the obvious beneficiaries. It is open to conjecture whether the implied recovery rates can be backed up by a detailed examination of the insurance fee imposed on the beneficiary banks, as well as the conversion rate of the preferred shares that the government has acquired through capital injection. The authors also provide indications on haircuts that were observed on transferred assets to AMCs (bad banks) in Europe during the 2007-2009 GFC. These vary from 10-40% (SFEF, France) to 71% in Slovenia (DUTB, Slovenia). In some other cases of AMCs, mostly with public ownership stakes, assets have not been transferred but, rather, assigned to the AMC at book values, so that no haircut took place. Based on a simple framework, they clarify the economics behind bank restructuring and assess various restructuring options for systemically important banks. The case study of the recap and asset guarantee of RBS and Lloyds-HBOS suggests that the conversion rate of the preferred shares that the government acquired through capital injection can give indications as to the market value of the recovery rate. Understanding the accounting framework imposed by Eurostat rules helps provide contrast between privately owned AMCs and publicly owned ones. From an economic perspective, dealing with NPLs carved out from banks undergoing restructuring must be distinguished according to whether it is a non-systemic event, or it implies a systemic risk dimension. In the former case, the issue may be addressed from a micro – individual bank – perspective while in the latter, the systemic dimension calls for necessary macro considerations. In this section, first we consider the credit channel literature and then we summarise two recent proposals – the one cited above put forward by Andrea Enria, chairman of the European Banking Authority (EBA), and suggestions by Avgouleas and Goodhart (2016) on how to deal more effectively and efficiently with NPLs. The credit channel literature owes greatly to Ben Bernanke – e.g., Bernanke (1983) – and to a group of economists refocusing scholarly attention on the macro implications of imperfect banking markets. In essence, bank credit markets are plagued by information asymmetries between borrowers and banks, causing two different problems: adverse selection and moral hazard.12)This sub-section partly draws on D’Apice and Ferri (2010).Adverse selection arises before a contract is signed. It refers to situations where potentially less desirable borrowers, from the point of view of lenders, are also those who will more likely be approved for a loan (Greenwald et al., 1984). This may lead to equilibrium credit rationing. Due to information asymmetries, lenders cannot see the specific quality of each borrower and to avoid attracting low-quality borrowers (adverse selection) refrain from increasing the loan interest rate, to keep it stable and reducing the supply of credit (Stiglitz and Weiss, 1981). So, excess demand affects a share of not financed potentially productive investments, with negative macroeconomic effects. To minimize adverse selection, lenders must be adept at screening good quality businesses. In turn, moral hazard arises ex post where lenders undergo the risk that borrowers behave irresponsibly (opportunistic behaviour), jeopardizing loan payback. A typical moral hazard situation occurs when borrowers have incentives to invest in high-risk projects in which, if the outcome is positive, they obtain high profits; whereas, if the outcome is negative, lenders bear the losses. With high moral hazard, banks curb loan supply and, thus, contribute to slow down economic activity. To minimize moral hazard problems, debt contracts include collateral guarantees and provisions to limit a borrower’s opportunistic actions, and banks must closely monitor that borrowers respect those provisions. Screening and monitoring are very important for bank solvency, but become extremely difficult to carry out during systemic financial crises, aggravating the initial effects of the shock (Mishkin, 1999). Many empirical studies show that interest-rate variations are not enough to explain the scope of macro fluctuations. Thus, the credit channel literature (Bernanke and Gertler, 1995) offers a framework featuring an additional transmission mechanism of monetary policy shocks and/or financial shocks. Acknowledging the existence of frictions in the credit market, due to information asymmetries, the credit channel identifies three distinct transmission sub-channels of monetary policy: balance-sheet channel, bank-lending channel, and bank-capital channel. First, the balance-sheet channel, due to possible borrowing constraints, links the width of the external finance premium (EFP) – the wedge between the cost of external funding and the ‘opportunity cost’ of using internal funds – to the borrower’s financial soundness. Specifically, the higher the latter’s net worth, the smaller the EFP. This is because, there is a low probability of conflict of interest between high net-worth borrowers and lenders, due to the fact that a larger portion of the loan is backed by collateral. Monetary policy and/or financial shocks, via this channel, through a change in interest rates, not only modify the cost of credit, but also borrowers’ financial soundness, thus creating an additional propagation effect. For example, an increase in interest rates negatively affects borrowers’ financial soundness and their ability to borrow money, through both direct mechanisms – such as higher cost of debt at variable rate or reduction of value of collateral securities – and through indirect mechanisms – such as reducing household consumption levels – which in turn cut business profits. Second, the bank-lending channel focuses on the possible deterioration in the capacity of intermediaries to provide credit. For example, an interest-rate increase may lead savers to shift their funds from deposits to other higher yielding investments. If banks are unable to compensate this outflow of resources with other liabilities, their capacity to grant loans is considerably reduced and this may slow down the macro-economy. Those most affected are businesses using almost exclusively bank credit, induced to cut their investment level. If, on the other hand, banks can offset the deposit outflow with other kinds of liabilities, the volume of funds they raise does not change, but its cost increases, as alternative deposit funds are usually more expensive. The higher cost for funding is then translated into a further interest rate increase for the borrowing businesses, which also in this case, will have to reduce investment. Third, the bank capital channel runs as follows. When banks suffer a marked reduction of their capital, e.g. due to major losses on loans granted at the peak of a credit boom, they have two alternatives to re-establish the due ratio between net worth and assets: obtaining new capital or reducing the supply of credit. When losses occur in the mid of a systemic financial crisis, raising capital is extremely difficult and, as a result, banks usually curb their loan supply. This, in turn, harms the macro-economy burdening it with a credit crunch, defined by the Council of Economic Advisors (1991) as “a situation in which the supply of credit is restricted below the range usually identified with prevailing market interest rates and the profitability of investment projects”. Many authors have studied this channel – from bank capital to bank lending – generally finding a significant negative causality, going from increased bank capital requirement to less bank lending. In a seminal paper, Peek and Rosengren (1995) argue that banks, whose capital is not constraining the expansion of their assets, when receiving a negative shock to capital should intensify deposit taking to compensate for the drop in their liabilities implicit in the drop of capital. Thus, for not capital-constrained banks, one should expect a negative nexus between shocks to capital and deposit taking. On the contrary, they find a positive link between shocks to capital and the dynamics of deposits in 1990 for US banks. They conclude this evidence suggests the capital constraints for banks were pervasive as the Basle Committee ratios were phased in and, indeed, show that the impact is greater for banks with lower initial capital ratios. Berger and Udell (1994) concur that the expansion of loans was lower in 1990-92 for less-capitalized banks. Peek and Rosengren (2000) use geographical separation as their means of identifying supply shocks: Japanese banks lost capital as a result of NPLs in Japan. The authors then show that the withdrawal of these banks from lending to US real estate had strong dampening effects on US commercial real estate markets. Clearly, it is hard to attribute the fall in real activity to demand side effects. In turn, Chiuri et al. (2002) test for emerging economies the hypothesis that enforcing bank capital asset requirements (CARs) exerts a detrimental effect on loan supply. They find that Basel 1 CAR enforcement notably cut credit supply, particularly at less capitalized banks. In turn, Van den Heuvel (2008), on US data, finds the welfare cost of current capital adequacy regulation to be equivalent to a permanent loss in consumption of between 0.1 to 1%. Gambacorta and Mistrulli (2004), study cross-sectional differences in the response of lending to monetary policy and GDP shocks owing to differences in bank capitalization, trying to disentangle the effects of the “bank lending channel” from those of the “bank capital channel.” The results, based on a sample of Italian banks, indicate that bank capital matters in the propagation of different types of shocks to lending, owing to the existence of regulatory capital constraints and imperfections in the market for bank fund-raising. Meh and Moran (2010) show that, following adverse shocks, economies whose banking sectors remain well-capitalized suffer smaller cuts in bank lending and less pronounced downturns. On US data from 2001 to 2011, Carlson et al. (2013) find that the relationship between capital ratios and bank lending was significant during and shortly following the recent financial crisis. They also show that the relationship between capital ratios and loan growth is stronger for banks where loans are contracting, than where loans are expanding. Finally, they find that the elasticity of bank loans with respect to capital ratios is higher when capital ratios are relatively low, suggesting a non-linear effect of capital ratio on bank lending. Badarau-Semenescu and Levieuge (2010) verify the existence of the bank capital channel in Europe and its heterogeneity inside the union. Precisely, the channel is strongest in Germany and Italy, and weakest in Finland, France and Spain. Dell’Ariccia et al. (2008) note that banking crises usually lead drops in credit and growth and ask whether crises tend to take place during economic dips, or whether banking crises independently upset the economy. To answer this question, they study industrial sectors with differing financing needs. If banking crises exogenously dampen real activity, then sectors more dependent on external finance should perform relatively worse during banking crises. Their evidence supports this view. In addition, they show that sectors predominantly populated by typically bank dependent small firms perform relatively worse during banking crises, while the differential effects across sectors are stronger in developing countries, in countries with less access to foreign finance, and with more severe banking crises. The ample evidence of a negative link between bank capital needs and bank lending suggests that the large accumulation of NPLs, by denting their capital, is pushing European banks to cut their loans. For instance, studying the credit crunch in Europe, Wehinger (2014) identifies one of the main factors in “the need for bank recapitalisation has reduced lending and further aggravated the crisis.” Clearly, then, in this systemic crisis scenario, measures limiting haircuts on NPLs would help soften the credit crunch. On 30 January 2017, Andrea Enria, EBA’s chairman, called on Brussels policymakers to create a European AMC (we will call it Eurozone AMC, EZ-AMC) to buy billions of euros of toxic loans from lenders in order to break the vicious circle of falling profits, squeezed lending and weak economic growth (see also Haben and Quagliariello, 2017).13)See also the arguments put forth by Beck (2017). Enria noticed that the scale of the region’s bad debt problem has become urgent and actionable as lenders now hold more than €1tn of toxic loans. He proposes that the EU should create a taxpayer-backed fund to buy bad loans from struggling lenders at their ‘real economic value’ – a level to be determined by the fund after doing due diligence on the loans. This would have the double benefit of increasing transparency around the true value of the vast piles of NPLs clogging up the balance sheets of many banks in the region and increase the size of the nascent market for such assets. The European Central Bank has also suggested that the creation of well-designed AMCs should be carefully considered as part of plans to shore up the Eurozone’s financial stability. Enria proposed a graph (reported here as Figure 1) to exemplify how the presence of EZ-AMC would help address the current European NPL banking problem. 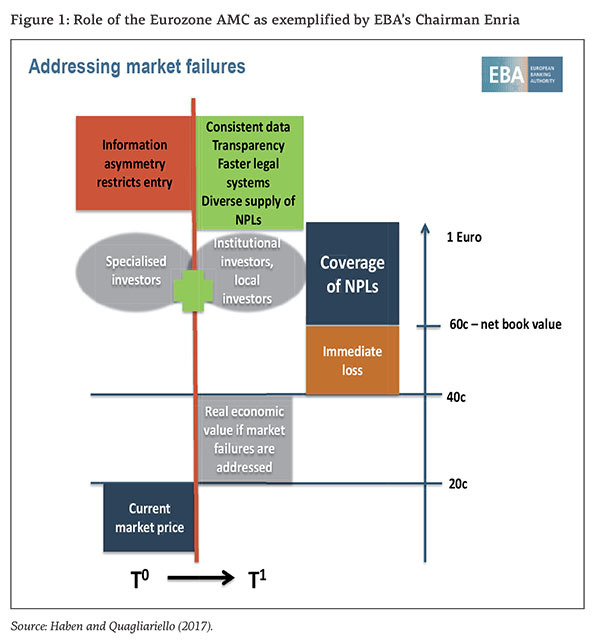 In practice, the various market failures we outlined above (and that we will further address in section 4) are currently depressing the price of NPLs to 20c out of €1, well below the 40c that would be reached if market failures were removed. Enria argues that the unduly low NPL price – unduly high NPL haircut – depends on information asymmetry restricting entry as buyers only to specialist investors. He suggests that by releasing consistent data, raising transparency, speeding up legal systems, and diversifying the NPL supply, EZ-AMC could attract institutional investors and local investors and achieve an estimated doubling in price of NPL to 40c. Then, considering the average coverage ratio standing at 40c, NPL recognition would cost the average European bank an immediate loss of 20c, instead of the 40c loss suffered at the going (dysfunctional) market price. In essence, the EZ-AMC would be the catalyst for attracting institutional and local investors in NPLs, which would complement specialized investors. iii) the difference between current market prices (20c in the example) and real economic value (40c) could be the theoretical extent of state aid under precautionary recap, but in this interim period, financed by EZ-AMC capital and private investors. b) a recapitalisation would be exercised by the national government as state aid accompanied by full conditionality. 5) there is no burden sharing across EU countries: if the clawback clause is activated, it is the Member State which injects capital in the bank. Independently, Avgouleas and Goodhart (2016) have argued that there is a danger of over-reliance on bail-ins – the prior participation of bank creditors in meeting the costs of bank recapitalisation before any form of public contribution is made. In the authors’ view, bail-in regimes will not remove the need for public injection of funds, unless the risk is idiosyncratic. This suggestion raises concerns for banks on the periphery of the euro-area, which present very high levels of non-performing assets, crippling credit growth and economic recovery. To avoid pushing Eurozone banks with high NPL levels into bail-in centred recapitalisations, Avgouleas and Goodhart consider the benefits from, and legal obstacles to, the possible establishment of a euro-wide fund for NPLs that would enjoy an ESM guarantee. Long-term (capped) profit-loss sharing arrangements could bring the operation of the fund as close to a commercial operation as possible. Cleaning up bank balance sheets from NPLs would free up capital for new lending, boosting economic recovery in the periphery of the Eurozone. Goodhart and Avgouleas seem to be in line with the EZ-AMC proposed by Chairman Enria. Two differences can be identified, however. First, Avgouleas and Goodarht explicitly refer to an ESM guarantee supporting an EZ-AMC, something Enria is silent about. Second, they suggest that institutions selling NPLs to EZ-AMC should be subject to a structural conditionality, similar to that undertaken by the UK government in the context of the RBS rescue, while Enria doesn’t mention such a possibility. Overall, our arguments support the need to establish EZ-AMC. Regarding the possible involvement of the ESM as an external guarantor, that appears a natural evolution to us, given the ESM mandate extends to provide support to foster Eurozone banks stability, as exemplified through its backing of various macro adjustment programs and, especially, by the €100 billion it provided to recapitalise ailing banks in Spain. Concerning the structural conditionality proviso for banks transferring NPLs to the EZ-AMC, we concur it could help tackle fears of reinforcing big banks and the Too-Big-To-Fail subsidy, while potentially opening up Eurozone banking markets to new contestants/entrants. The first undesirable outcome is that some banks are forced into undeserved restructuring. A bank loaded with a certain amount of NPLs, which would still be sound enough if its NPLs were valued at fair value, might be triggered into restructuring, if its NPLs are heavily discounted along negative market expectations. Instead, the presence of EZ-AMC would provide a backstop to fair value of this bank’s NPLs and prevent it enduring unjustified restructuring. The second undesirable outcome regards a bank that effectively needs to be restructured, even when its NPLs are valued correctly at fair value. In this case, restructuring is appropriate. However, if the carved out NPLs are valued with the heavy discount of illiquid markets, the haircut will be exaggerated with respect to fundamentals. In turn, investors who then buy those assets at extremely favourable prices will later on be able to reap extraordinary profits when either reselling the assets over time, or waiting for the historic recovery rates to kick in. In this case, the presence of EZ-AMC would also provide a backstop and prevent deserved restructurings from unduly penalizing distressed banks, while generating huge profits for investors. In all, in both cases – avoiding undeserved bank restructurings and avoiding excessive haircuts on the NPLs of appropriately restructured banks – the presence of EZ-AMC helps select the “good” equilibrium where, in a multiple equilibria set-up, the “bad” equilibrium would instead be selected by the market. The reasoning above may be represented though a model adjusted from the one proposed by Paul De Grauwe (2016) in his Chapter 5 “The Fragility of Incomplete Monetary Unions”. In essence, De Grauwe adjusts the second-generation model of exchange rate crisis to deal with the issue of the sovereign crises within a Monetary Union (MU) which is incomplete, in the sense that it lacks a Budgetary Union (BU). De Grauwe’s argument runs as follows, starting from exchange rate crises. Over time, fixed exchange rate regimes (incomplete MUs) tend to disintegrate after speculative crises. The key reasons for the fragility of these regimes is the lack of credibility of the fixed exchange rate commitment and the international reserve (liquidity) constraint. On one hand, the “first generation model” of exchange crises predicts that these crises occur because the authorities follow domestic policies that are inconsistent with the fixing of the exchange rate. On the other hand, in the “second generation model” more than one equilibrium is possible, whereby picking the equilibrium depends on speculators’ expectations. In this model, speculation is self-fulfilling and can bring down the fixed exchange rate, even if the authorities behave well. At this point, De Grauwe argues that the Eurozone is an incomplete MU and is also fragile, much like a fixed exchange rate system. Thereby, multiple equilibria are possible. These can arise in a self-fulfilling way and depend only on the expectations (beliefs) of investors. These multiple equilibria arise because of the absence of a central bank willing to provide unlimited amounts of liquidity during speculative crises. Some countries can be pushed into a bad equilibrium, characterized by unsustainably high interest rates, recession and budgetary austerity. Countries that are pushed into a bad equilibrium also experience a banking crisis. Countries can also be pushed into a good equilibrium characterized by low interest rates, declining budget deficits and a boom in economic activity. These multiple equilibria arise because of a coordination failure in the market system. We now adjust De Grauwe’s model, taking it to the case of a single bank’s restructuring in a situation of systemic crisis of the national banking system which the bank belongs to. But, before doing that, let us consider the simpler case in which the decision whether to restructure the banks is taken in a normal situation – i.e., the bank is non-systemic and its national banking system is not in a systemic crisis. We define a Loss curve (Lfh) that is an increasing function of the bank’s NPLs, where NPLs are valued at the ‘fair’ haircut. We also define the Going-Concern line (GC) representing the value of the bank as a going concern – i.e. the bank’s goodwill due to its good reputation, trained workforce, established and successful procedures, tested systems, operational equipment, and necessary licenses and permits – which will be horizontal since it doesn’t change with the bank’s NPL. Figure 2 puts together Lfh and GC. Since Lfh is an increasing function of the bank’s NPL (starting from 0 when NPL=0) while GC stays constant, as we let NPL increase there will be a unique point at which Lfh crosses GC from below. Let’s denote that point as NPL*. For any NPL value below NPL* the losses are lower than GC, implying that the bank should not be restructured, since its value as a going concern is more than the losses it is incurring. When NPL exactly equals NPL* we are in a situation of indifference, since the losses are just equal to GC. For any NPL greater than NPL* the bank should be restructured. Here, there is only one equilibrium. 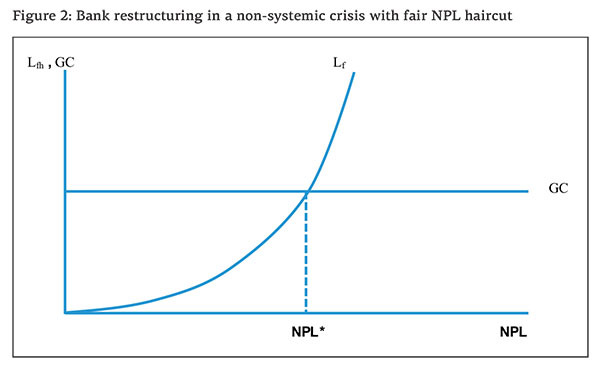 Let us now consider what happens in a systemic crisis, when we also allow for a heavy ‘discount’ haircut of the NPL, as represented along a second Loss curve (Ldh). In Figure 3, for any NPL level Ldh lies to the left of Lfh. Now, depending on whether the fair discount applies – in which case we are along Lfh – or the heavy discount applies – in which case we are along Ldh – we will have two different thresholds: NPL*, identified by Lfh crossing GC, lies to the right while NPL**, identified by Ldh crossing GC, lies to the left. At one extreme, any bank whose NPL is below NPL** will not undergo restructuring. At the other extreme, any bank whose NPL is above NPL* will need restructuring. However, for all the banks whose NPL is above NPL** but below NPL* there is no need of restructuring applying the fair haircut, whereas they will have to undergo restructuring if the heavy discount haircut applies. In other words, for all these banks there are two possible equilibria. In the good equilibrium they will not be restructured, whereas they will need restructuring if the bad equilibrium prevails. This shows how EZ-AMC would greatly improve the outcome. Since EZ-AMC would apply the fair haircut and would be willing to buy unlimited amounts of carved NPLs, its presence would provide unlimited liquidity and a backstop able to anchor the market to the good equilibrium. In practice, analogously to what happened with the Outright Monetary Transactions (OMT), it might suffice to announce the existence of EZ-AMC, to rule out the bad equilibrium. Indeed, even though the OMT was never used, its very announcement was enough for markets to rule out the bad equilibrium triggering undeserved sovereign debt crises of euro member countries. In analogy, here, all banks with NPL** < NPL < NPL* would be spared unneeded restructuring, with the related costs for those banks and with the possible negative spillovers to other banks from the same country. Furthermore, the presence of EZ-AMC would also generate positive effects for those banks that need restructuring when evaluated with fair haircut. These positive effects would descend from the fact that, in any case, EZ-AMC would anchor the solution to the good equilibrium and allow these banks’ NPLs to be valued at much higher prices than in cases where the bad equilibrium was to prevail. The only damage would be for speculators who would no longer be able to make extraordinary profits by exploiting the fire-sale of European banks’ NPLs. However, in our opinion, those exaggerated profits were the signals of a malfunctioning market that EZ-AMC would help to solve.14)An example here is the case of how NPLs were valued in the resolution of four non-systemic banks in November 2015 in Italy. Through negotiations with the European Commission, the valuation was set at 17.6c, well below the historical record of NPL recovery rates in the order of 40c. In practice, it seems that this valuation was forced by adverse market conditions for disposing NPLs and not by true changes in recovery rates. In fact, Carpinelli et al. (2016) document that recovery rates for NPL liquidations in Italy in the years 2011-2014 were still slightly above 40c. Alas, for months after the resolution 17.6c became the reference to value NPLs for the country’s banking system, possibly dragging down the market value of many Italian banks through contagion. We have argued that dealing effectively and efficiently with legacy NPLs carved out from banks under restructuring may be achieved via private sector or state supported initiatives, depending on the situation at hand. While in the case of non-systemic bank restructuring, private sector initiatives might prove successful, state support is needed when restructurings have to be dealt with in systemic crises. Historical experience – briefly analysed above – suggests the need of a centralised solution, or a comprehensive programme to deal with legacy NPLs when the crises are systemic. This is evidenced by the failures in Japan in the 1990s (the ‘lost decade’), and the successes of Sweden in the 1990s, Spain more recently (with the creation of FROB and SAREB and the provision of European funds), and the US, both during the S&L episode that led to the establishment of RTC and during the GFC, with the creation of TARP and the adoption of stringent stress tests. Considering that banking crises throughout Europe have been prevalently systemic in nature, we have summarized in this paper the basics of the credit channel literature and presented a simple model, describing how bank restructurings in systemic crises may feature a ‘bad’ equilibrium (triggering excessive restructurings and haircuts) along with a ‘good’ equilibrium (with appropriate restructurings and fair haircuts). Drawing on historical experience, theory and empirical evidence, we support the proposal – already put forward by some scholars and policy-makers – to establish a Eurozone level AMC (EZ-AMC). 6) finally, but no less important, the EZ-AMC would promote accountability, since its profits (that are likely to be quite high based on past historical records of similar experiences throughout the world) would be channelled back to the European people, possibly helping to fill the so far not totally funded Resolution Fund, which would avoid relying on taxpayers money in the event of a major shock occurrence. Avgouleas, E., and Goodhart, C. (2016). An Anatomy of Bank Bail-ins. Why the Eurozone Needs a Fiscal Backstop for the Banking Sector. European Economy: Banks, Regulation, and the Real Sector 2. Ayadi et al. (2016). Banking Business Models Monitor for Europe 2015. IRCCF, HEC Montreal, Montreal. Badarau-Semenescu, C., and Levieuge, G. (2010). Assessing the potential strength of a bank capital channel in Europe: a principal component analysis, The Review of Finance and Banking 2.1. Beck, T. (2017). An asset management company for the Eurozone: Time to revive an old idea, Voxeu, 24 April. Berger, A.N., and Udell, G.F. (1994). Did Risk-Based Capital Allocate Bank Credit and Cause a ‘Credit Crunch’ in the US? Journal of Money, Credit, and Banking, 26, 585-628. Bernanke, B.S. (1983). Non-Monetary Effects of the Financial Crisis in the Propagation of the Great Depression. American Economic Review, 73, 257–76. Bernanke, B.S., and Gertler, M. (1995) Inside the Black Box: The Credit Channel of Monetary Policy Transmission, Journal of Economic Perspectives, 9, 27–48. Carlson, M., Shan, H., and Warusawitharana M. (2013). Capital ratios and bank lending: A matched bank approach. Journal of Financial Intermediation, 22 (4), 663-687. Carpinelli, L., Cascarino, G., Giacomelli, S., and Vacca, V.P. (2016). The management of non-performing loans: a survey among the main Italian banks. Bank of Italy Occasional Paper No. 311. Chiuri, M.C., Ferri, G., and Majnoni, G. (2002). The macro-economic impact of bank capital requirements in emerging economies: past evidence to assess the future. Journal of Banking & Finance, 26.5, 881-904. Council of Economic Advisors (1991). Economic Report of the President, Washington, D.C.
D’Apice, V., Ferri, G. (2010) Financial Instability. Toolkit for Interpreting Boom and Bust Cycles, Palgrave McMillan. De Grauwe, P. (2016). Economics of Monetary Union, Oxford University Press, 11th Edition. Dell’Ariccia, G., Detragiache, E., and Rajan, R. (2008). The real effect of banking crises, Journal of Financial Intermediation, 17 (1), 89-112. Enria, A. (2017). EU needs to create ‘bad bank’ for €1tn toxic loan. The Financial Times, January 30th. European Banking Authority (2016). Dynamics and drivers of non-performing exposures in the EU banking sector, 22 July, EBA, London. Fujii, M., and Kawai, M. (2010). Lessons from Japan’s banking crisis, 1991-2005, ADBI working paper No. 222, June. Gambacorta, L., and Mistrulli, P.E. (2004). Does bank capital affect lending behavior? Journal of Financial intermediation, 13.4, 436-457. Gandrud, C., and Hallerberg, M. (2014). Bad banks in the EU: The impact of Eurostat rules, Bruegel Working Paper No. 2014/15. Greenwald, B., Stiglitz, J.E., and Weiss, A. (1984). Information Imperfections in the Capital Market and Macroeconomic Fluctuations. American Economic Review, 74, 194–199. Haben, P., and Quagliariello, M. (2017). Why the EU needs an asset management company, Central Banking 20 February: 1-7. Landier, A., and Ueda, K. (2009). The economics of bank restructuring: Understanding the options. https://papers.ssrn.com/sol3/papers2.cfm?abstract_id=1415033. Lastra, R. (1996). Central Banking and Banking Regulation, Financial Markets Group of the London School of Economics (LSE). Medina Cas, S., and Peresa, I. (2016). What makes a good ‘bad bank’? The Irish, Spanish and German Experience, European Commission Discussion Paper 036, September. Meh, C.A., and Moran, K. (2010). The role of bank capital in the propagation of shocks. Journal of Economic Dynamics and Control 34 (3), 555-576. Mishkin, F.S. (1999). Global Financial Instability: Framework, Events, Issues. Journal of Economic Perspectives, 13 (4), 3–20. Peek, J., and Rosengren, E. (2000). Collateral Damage: Effects of the Japanese Bank Crisis on Real Activity in the United States. American Economic Review, 90 (1), 30-45. Peek, J., and Rosengren, E. (1995). The Capital Crunch: Neither a Borrower nor a Lender Be. Journal of Money, Credit and Banking, 27 (3), 625-638. Stiglitz, J.E., and Weiss, A.M. (1981). Credit Rationing in Markets with Imperfect Information. American Economic Review, 71, 393–410. Van den Heuvel, S.J. (2008). The welfare cost of bank capital requirements. Journal of Monetary Economics, 55 (2), 298-320. Wehinger, G. (2014). SMEs and the credit crunch. OECD Journal: Financial Market Trends 2013.2, 115-148. The EU Member States committed from 2008 up to 2014 in total EUR 4.9 trillion (35 % of EU GDP in 2014), of which EUR 1.9 trillion (13.9 % of GDP) has been effectively used. 2. ↑ Introduced and expected to be transposed into the member states’ national laws on 31 December 2014. 4. ↑ However, as we discuss later, since the coming into force of the BRRD, any bank receiving state aid must impose losses on its unsecured bondholders. See arts 44(5) and (7), 37(10)(a), Rec 73, BRRD. 6. ↑ https://www.ft.com/content/3b18e5ec-d047-36b2-a35a-10ae8e6a76ed. It should be noted, however, that the €1 trillion of gross NPLs reduces to €0.6 trillion net NPLs if one considers the average coverage ratio of 40% that European banks possess. 7. ↑ See http://www.frob.es/en/Paginas/Home.aspx The Fondo de Reestructuración Ordenada Bancaria (FROB), was a government funded program adopted by the Spanish government in June 2009 to manage the restructuring and resolution of troubled credit institutions (cajas de ahorro and others). 9. ↑ The authorities had long refused to recognize the full extent of bank NPLs till the late 1990s. As a part of comprehensive efforts to revitalize the banking system and the economy, in April 2003, the government established a new asset management company, the Industrial Revitalization Corporation of Japan (IRCJ). IRCJ was designed to promote the restructuring of relatively large and troubled, but viable, firms by purchasing their loans from secondary banks, leaving the main bank and IRCJ as the only major creditors. The IRCJ was expected to promote “structural reform” of the Japanese economy. 12. ↑ This sub-section partly draws on D’Apice and Ferri (2010). 13. ↑ See also the arguments put forth by Beck (2017). 14. ↑ An example here is the case of how NPLs were valued in the resolution of four non-systemic banks in November 2015 in Italy. Through negotiations with the European Commission, the valuation was set at 17.6c, well below the historical record of NPL recovery rates in the order of 40c. In practice, it seems that this valuation was forced by adverse market conditions for disposing NPLs and not by true changes in recovery rates. In fact, Carpinelli et al. (2016) document that recovery rates for NPL liquidations in Italy in the years 2011-2014 were still slightly above 40c. Alas, for months after the resolution 17.6c became the reference to value NPLs for the country’s banking system, possibly dragging down the market value of many Italian banks through contagion.